My name’s Maria Cordero and I was awarded a WIT scholarship in 2015. I had already started Chemistry in TCD when I heard about the WIT scholar program from another student who told me that I should apply! If it wasn’t for her I don’t know what I’d be doing right now. I got called to interview at the Leixlip campus which was exciting enough and then a few weeks after that I got a call to say that I was selected as one of that year’s WIT scholars! I don’t think I realized at the time how many amazing opportunities I’d have thanks to the program. After third year I got to do a 12 week placement with Intel in the Wet Etch department. Overall it was such a valuable experience: I was given a lot of responsibility and independence but also worked with a fantastic team who were so willing to answer any of my questions. It’s not like a lot of student internships where I’d be photocopying or making coffee all day. I had a chance to meet people from departments all over the factory with a wide range of backgrounds and great advice to give. One thing that I’ve particularly loved is how I’ve been able to be creative in the projects I’m working on: I’ve always been passionate about both chemistry and art and you don’t often get a chance to use the two. 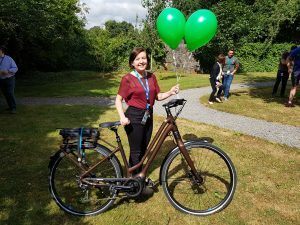 I’m also really lucky that in the short time I was here I managed to win an electric bike and got to celebrate Intel’s 50th birthday with a huge celebration on site! On top of the internship, the WIT program has been a massive help over the last three years by giving me a yearly grant and an amazing mentor Áine. Because I moved from Cork to Dublin for college the grant was a significant help financially and meant that I never had to take focus off my academic work for a part time job. The mentorship is also such a great part of the program; Áine’s been able to answer any question I’ve ever had about my career, Intel or anything else. I’ve also been able to volunteer at events like Intel’s Mini Scientist and the BT Young Scientist over the past few years where I got to meet the other WIT scholars and Intel staff. The WIT scholar program has completely changed my college life and I’m so grateful for all of the opportunities it’s provided me. I’ve spent the last three years telling every single woman in STEM I know to apply! The application window is now open for the 2018 scholarship program with submissions being accepted until October 5th. Further details, along with the online application form, can be found at www.intel.ie/womenintechnology. Intel (NASDAQ: INTC) expands the boundaries of technology to make the most amazing experiences possible.